The Nintendo 2DS™ is available as an Authentic Nintendo Refurbished Product only from Nintendo, and it comes with our standard one year warranty. Although it may have minor cosmetic blemishes, it is guaranteed to be fully functional. We think you will find the standards for Authentic Nintendo Refurbished Products are VERY high. When you pick up a Nintendo 2DS, you get all the features of the Nintendo 3DS™ system, minus 3D. The Nintendo 2DS system plays Nintendo 3DS (and even Nintendo DS™) games in 2D, so you have tons to choose from. Connect with friends, other players, and wireless hotspots using the wireless StreetPass™ and SpotPass™ communication modes to unlock exclusive content for games and download other entertainment. From games to photos and beyond, Nintendo 2DS is the ultimate 2D gaming experience. 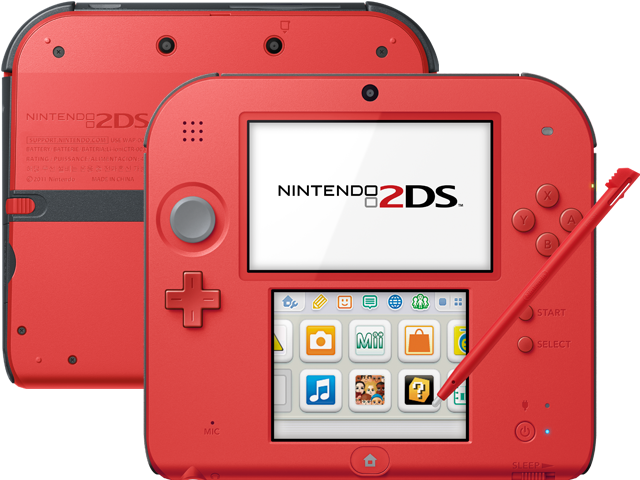 Includes Refurbished Crimson Red 2 Nintendo 2DS System, AC Adapter, stylus (color may vary), 4GB SD Memory Card, and 6 AR Cards. Nintendo 2DS plays Nintendo 3DS games in 2D only.